Available: Tuesday - Saturday from 12:00 - 16:00. Golden pastry bags filled with minced chicken. Served with sweet chilli dip. Thai fishcakes served with sweet chilli dip. Deep fried chicken blended with Thai spices & green beans. Served with sweet chilli dip. Marinated chicken with turmeric & Thai sauce on skewers. Served with peanut sauce. Served with sweet chilli dip Marinated chicken with Thai spicy sauce on skewers. Hot. Served with sweet chilli dip. Thai style barbecued pork on skewers. Available: Tuesday - Saturday from 12:00 - 16:00. All mains are served with rice or chips, or for egg fried rice simply click 'Select Extras' in your cart. Choice of meat cooked in Thai Red curry paste, coconut milk & vegetables. Choice of meat cooked in Thai green curry paste, coconut milk & vegetables. Cooked in may flower sauce with mixed vegetables. Choice of meat cooked in yellow curry paste, cocnut milk & vegetables. Choice of meat cooked in Massaman curry paste, cocnut milk, carrots, onion & potatoes. Choice of meat cooked in Panang curry paste, coconut milk, vegetable & lime leaf. Stir fried choice of meat with vegetables & basil. Stir fried choice of meat with vegetables in chilli oil paste. Stir fried choice of meat in oyester sauce with vegetables. Stir fried choice of meat with vegetables in sun dry chilli paste. Stir fried choice of meat with fresh ginger & vegetables. Stir fried choice of meat in sweet & sour sauce with pineapple & vegetables. Stir fried choice of meat with cucumber, fresh tomato & vegetables. Stir fried rice noodle in Pad Thai sauce & veg. Stir fried egg noodle in chilli oil with veg. Stir fried egg noodle in dark soy sauce with veg. Stir fried rice noodle in spicy sauce & basil. Choice of meat cooked in red chilli paste with vegetables, lime leaf & basil. Stir fried choice of meat in red chilli paste with vegetables, lime leaf & basil. Rice noodle & vegetables in home made stock. Famous hot & sour soup with vegetables & Thai herbs. Chicken in traditional coconut broth with vegetables and Thai herbs. Available: Tuesday - Saturday from 12:00 - 16:00. Served with chips or salad. Mixed salad in Thai chilli sauce. Chicken, mixed salad in Thai chilli sauce. Pork, mixed salad in Thai chilli sauce. Sliced beef, mixed salad in Thai chilli sauce. Minced pork in Thai sauce with roasted ground rice, carrots, onion & coriander. 4 x pork skewers & sticky rice. Minced chicken pad ga prow with fried egg (One of the most popular Thai street foods, stir-fried minced chicken with green beans, onion & basil topped with a fried egg) Served with chips or rice. Minced pork pad ga prow with fried egg (One of the most popular Thai street foods, stir-fried minced pork with green beans, onion & basil topped with a fried egg) Served with chips or rice. 3 x prawn in blankets & prawn pad thai. Mixed starter A - plain crackers - any main course - chips or rice - any main course with beef - chips or rice. Mixed starter C - Thai crackers - pad pik geang chicken or jungle curry chicken - chips or rice - chinese curry beef -chips or rice. Golden pastry bags filled with minced pork. Served with sweet chilli dip. Prawn & mince chicken wrapped in light crispy pastry. Served with sweet chilli dip. Deep fried white fish blended with Thai spices & green beans. Served with sweet chilli dip. Marinated spare ribs covered in sweet sauce, fried garlic, onion & peppers. Thai style barbecued pork on skewers. Served with sweet chilli dip. 2 x chicken & prawn on toast - 3 x veg spring rolls - 4 x money bags - sweet chilli dip. 4 x crispy squid - 3 x crispy chicken - 2 x crispy prawns - 2 x king prawns in blankets - sweet chilli dip. 2 x chicken satay - 2 x pork skewers - 6 x chicken meatballs - satay sauce - sweet chilli sauce. Marinated chicken with Thai spicy sauce on skewers. Served with sweet chilli dip. Famous hot & sour soup with carrot, mushroom, broccoli, tomatoes, spring onion, coriander & Thai herbs. Rice noodles with cabbage, carrots, spring onion, coriander & bean sprouts in homemade stock. Egg noodles with cabbage, carrots, spring onion, coriander & bean sprouts in Tom Yum soup. Classic, traditional Thai soup with carrots, mushrooms, broccoli, onion, tomatoes & Thai herbs in a traditional coconut milk broth. A traditional spicy seafood in hot & sour soup with carrots, mushrooms, onion, broccoli, tomatoes & Thai herbs. Minced chicken wrapped in wonton pastry in homemade stock. Minced chicken with roasted ground rice, carrots, onion, spring onion & coriander seasoned with Thai sauce & lime juice. Minced pork with roasted ground rice, carrots, onion, spring onion & coriander seasoned with thai sauce & lime juice. Thai style seafood salad in spicy & sour sauce with glass noodles, onion, spring onion & coriander. Cooked in red chilli paste with bamboo shoots, mixed vegetables, lime leaf & basil. Stir fried in red curry paste with fresh ginger, mixed vegetables, lime leaf & basil. Choice of meat cooked in may flower sauce with mixed vegetable. Cooked in Massaman curry paste, coconut milk, potatoes, carrots & onion. Cooked in yellow curry paste with coconut milk, potatoes, carrots, broccoli & mixed peppers. Cooked in red curry paste with coconut milk, mixed peppers, green beans, carrot, courgette & basil. Cooked in green curry paste with coconut milk, mixed peppers, green beans, courgette & basil. Stir-fried with oyster sauce, mixed peppers, mushroom, carrot, onion, broccoli & cauliflower. Stir-fried with mixed peppers, carrots, onion, green beans & basil. Stir-fried with fresh ginger, mixed peppers, carrots, onion & green beans. Stir fried mixed peppers, carrots, onion, mushrooms & broccoli in sweet chilli oil. Stir fried mixed peppers, carrots, onion & broccoli in sun dried chilli topped with cashew nuts. Sweet & sour with pineapple, mixed peppers, carrots & onion. Mixed peppers, carrots, onion, broccoli & fresh tomato. Cooked in Panang curry paste with coconut milk, green beans, fresh chilli & finely chopped lime leaf. Stir fried with mixed peppers, carrots, onion, mushrooms & broccoli in oyster sauce. Stir-fried rice noodles in homemade Pad Thai sauce with egg, carrot, cabbage, bean sprouts & spring onions. Served with crushed peanuts. Stir-fried rice noodles in dark soy sauce with egg, carrot, cabbage, bean sprouts & spring onion. onion, lime leaf & basil. Stir-fried rice noodles in spicy sauce with egg, carrot, cabbage, bean sprouts, spring onion, lime leaf & basil. Stir-fried egg noodles in a dark soy sauce with carrot, cabbage, bean sprouts & spring onion. Rice noodles in dark soy sauce with carrots, onion & broccoli topped with Thai style gravy. Stir fried egg noodles in homemade pad thai sauce, carrot, cabbage, beans, sprouts & spring onion. Served with crushed peanuts. Stir fried egg noodle in spicy sauce with carrot, cabbage, beans, sprouts, spring onion, lime leaf & basil. Stir fried egg noodles in chilli oil with carrot, cabbage, bean sprouts & spring onion. Finely chopped lettuce, mixed peppers, cucumber, onion & tomatoes. Finely chopped lettuce, mixed peppers, cucumber, onion & tomatoes in Thai chilli sauce. Fresh papaya & tomatoes seasoned with lime juice & Thai sweet sauce topped with peanuts. Sliced chicken with mixed salad in Thai chilli sauce. Sliced pork with mixed salad in Thai chilli sauce. Sliced beef with mixed salad in Thai chilli sauce. Chicken, pork & beef with mixed salad in Thai chilli sauce. Served with chips or rice & a can of soft drink. Any curry with carrots, onion & potatoes. Absolutely delicious food! Ordered soups & noodle dishes and they were excellent as usual. The ingredients are incredibly fresh too. Thank you for your wonderful cooking. Couldn't ask for better, amazing food. Best takeaway in town, it is excellent. 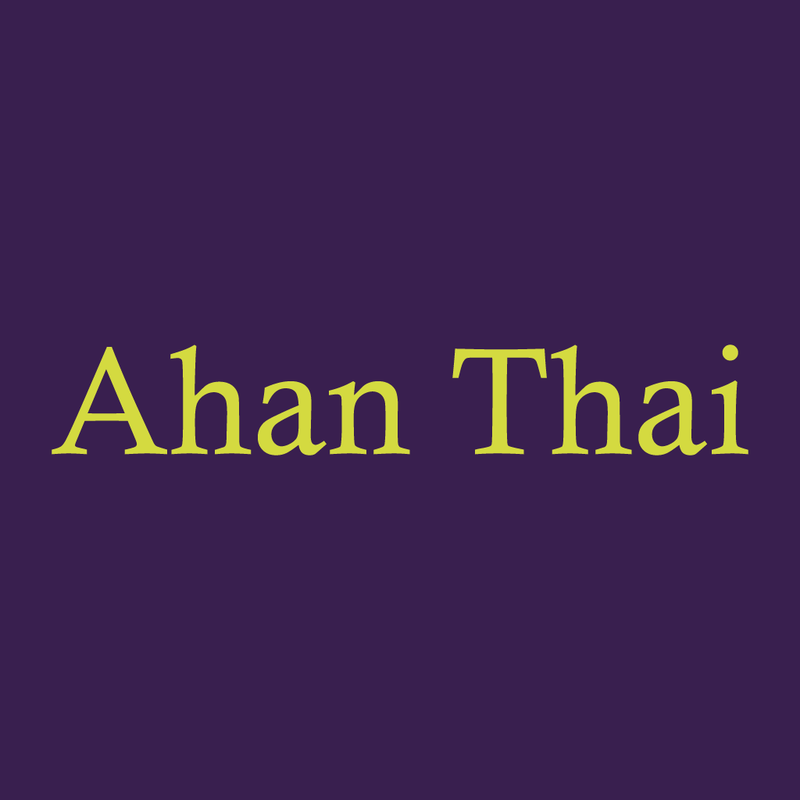 It's the best takeaway that I have ever used, now I use them all the time, the food is cooked beautifully, prawns get rubbery when over cooked, but this restaurant has never overcooked them, you won't regret getting a takeaway from here. Second time we've ordered from here. Food is great and very reasonably priced. It arrives exactly when it says it will. Very highly recommended. Beautiful freshly made authentic Thai food. Cracking food, cracking service. Definitely my new favourite takeaway !